It has been a while but I am back home after an amazing road trip through Spain and France! I have many good news to share with you but first I want to talk to you about le quinze août, August 15th which is a very special day in France. It is un jour férié, a bank holiday which means that if it falls on a Friday, vendredi or a Monday, lundi the French can have a long weekend, un long week-end ! This year, it fell on a Tuesday, mardi so many French workers did the bridge, ont fait le pont : they took Monday, lundi off. Faire le pont is like a mini holiday, des minis vacances but they are also massive traffic jams on the roads! Traffic jams are embouteillages or bouchons in French. Funnily or typically enough, those two words have to do with drinking! Embouteillage has the word bottle, bouteille in it and literally translates as “to put in a bottle”. When you are stuck in a traffic jam, you are like stuck in a bottle! Un bouchon also means the cork of a bottle of wine! Find out more about these funny words and expressions in this article about untranslatable French words you need for the summer holidays. Why is le quinze août a bank holiday? Because France is originally a Catholic country. The 15th of August celebrates the assumption of Saint Mary, mother of Jesus Christ into Heaven. As Jesus already went into Heaven on Jeudi de l’Ascension, it is now Mary’s turn to do so. French King, Louis XIII made it an official celebration with sacred processions. He asked Saint Mary to help him have a son. He did not have any children and he needed an heir! Fortunately, Louis XIV, le Roi Soleil was born and to thank La Vierge Marie, Virgin Mary, Louis XIII organised processions all over the country in her honor. 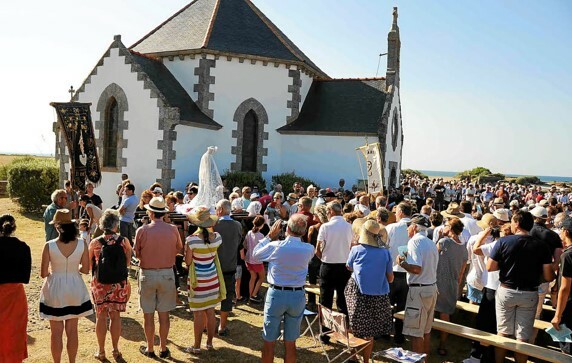 Nowadays, those processions are still taking place and where my parents in law live, in La Bretagne, a special mass is celebrated outside of the little chapel, next to the beach. It is beautiful and at the end of the mass, the priest blesses all the boats. When I was younger, I used to spend my summer holidays in the South West of France, in Arcachon and on the 15th of August, we could admire all the decorated boats on the sea being blessed by the priest. It is also called la fête de la mer, the celebration of the sea. In the night, there would be fireworks. Read more about this special day, its traditions and origins in this blog post for French learners: Qu’est-ce que c’est le 15 août en France ? It is now time to reveal the great news!!! I am finally back with new videos on YouTube!!! Whilst I was travelling to France, I spent a fabulous week at the Agen workshop. I got to learn from inspiring teachers and lecturers about language acquisition. It also motivated me to make my online stories even richer and more comprehensible. More about this amazing experience in my next newsletter! Here is the first story of Season 2. It is about a boy who wants to go to the countryside, la campagne and who meets a rather strange stone there! It is based on a Spanish story by Spanish Cuentos entitled “La roca tonta” (I love these stories!). Please note thate the word stupide in French is not a rude a word, it used to say something (or someone) is silly, does not make sense! In the comments below, let me know if you prefer la ville, the city or la campagne, the countryside? P.P.S Do you know about the Great Story Reading Project? You can read all types of wonderful stories in many languages and at different levels, from beginner to advanced. And you can also read my stories scripts!! !